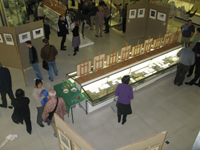 For the Private View the attendance was very good – some estimated there could have been over one hundred at its peak. This was a ‘quality attendance’ with all having a strong interest in the subject or being directly involved with the research. My family and friends were well represented, whom I thank for all their support and tolerance! The complements and feedback were very positive and I thank the Director of the Zoology Museum, Professor Michael Akam for his kind introduction. I would also like to thank Roz Wade, Mathew Lowe, Russell Stebbings and Stuart Turner for all their help and support in the project and especially for their help in installing the works. 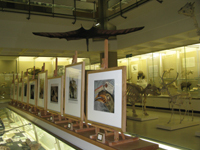 For the three days 2, 3, 4th November I was very busy at the University Museum of Zoology, Cambridge, installing the exhibition ‘Alfred Russel Wallace – The Forgotten Evolutionist’ this is the inaugural show of what is the nearly completed work resulting from my three years research. As is often the case, along with the full support of the Museum staff, we were working to the last minute making the show perfect before the guests arrived for the Private View at 5.30pm on the Wednesday. I am very pleased with the way the work occupies the space. 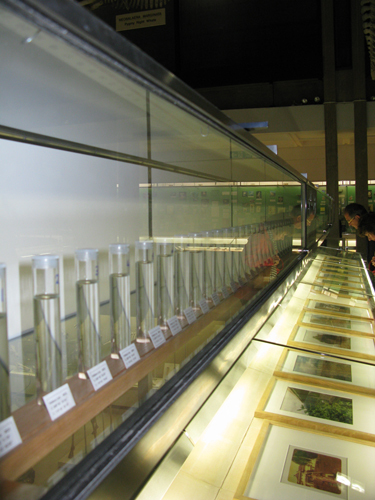 In the Museum collections, visually, there is some very strong competition with huge free standing mammal skeletons and very large glass display cases packed with wonderful specimens. However on the lower floor the impact of the colour photographs and the modes of the site specific installations hold equal weight if not dominate, especially when approached from the split mezzanine decent. 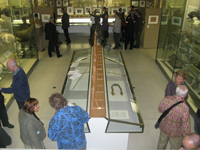 On the upper floor the ‘Wallace Line’ as an 8.3 metre installation looks spell-binding in its elegant simplicity – I consider this to be my greatest success of all the works. 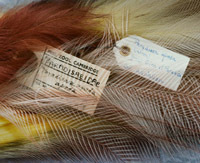 This exhibition explores the life, ideas and surviving collections of Wallace, the physical hard-ships he endured during his travels, and his contributions to the theories of Natural Selection and Evolution. Please post your comments. I look forward to discussing the themes of this exhibition in the near future.